Sleep Shepherd Blue Review – Is It Worth Buying? Reviewing the Sleep Shepherd Blue – Is It Worth Buying? The Sleep Shepherd Blue has been on the market for quite a long time, and it was created for those who have issues with getting a good night's sleep. While it may not be the perfect product, and it may have its flaws, let's find out if it is still a decent sleep monitor or worth buying. The previous version of this model was called Sleep Shepherd – and it was initially a sleep hat. That model is not in production anymore, as it was replaced by the “Blue” version. The latter proved to be not too popular either, as it has received complaints – and it doesn't has a decent rating in amazon. You should ascertain for yourself whether it's a good choice for you or not. The Sleep Shepherd Blue is a sleep aid and tracker that people use to monitor their sleep – no matter if they tend to have a good sleep or not. The purpose of this device is to lull people to sleep while recording their brain activity – but also to wake them up when they are required to. These sleep monitors are designed to come to the help of the millions of people that have sleeping problems – regardless of the gravity of the situation. The Sleep Shepherd Blue records your sleeping habit; you will know exactly when you are going through light sleep, deep sleep, REM sleep – and the other stages of sleep. The wearable sleep tracker was also meant to be comfortable so that it does not wake you up throughout the night. It feels like a headband, and its soft padding should make it all comfortable throughout the night. The built-in headphones are also easier to sleep with compared to the standard headphones – which tend to slip away throughout the night. Equipped with binaural beats and other technologies that help improve your sleep, this sleep tracker will not only show you data from the time that you were asleep – but it will also help your brain stay asleep if it refuses to do so. While almost every user had an issue to complain of, others were pleased with its ability to induce sleep. The Sleep Shepherd Blue is a wearable sleep tracker that you place around your head when you are planning to sleep. Compared to other non-wearable devices, this product has access to your brainwave activity – and is directly exposed to your body data. Some people are inconvenienced by the fact that they have to wear this product for it to be effective. However, the closer it is to your head, the easier it will be for the app to catch onto your brain waves. If the device is non-wearable, the result may not be as accurate – which is why this wearable device might be more efficient. To improve the sleep of the wearer, this product will wrap around the head like a headband, providing full comfort. Ideally, if you have long hair, you might want to pull it in a ponytail throughout the night – but even if you don't, your sleep should not be compromised. The material is soft and breathable, making it usable even throughout the warmer summer nights. It will wick away the sweat that gathers during your sleep – allowing you to feel nice and cool even if your ears are completely covered. Once you receive the unit, its setup is fairly quick and straightforward. You have to connect the app, which is easy to do – and once you have gone through the original installation, your unit will be remembered, and the connections will be done automatically. Considering that no actual setup is required to get this product going, you could say that it is convenient to use. With just one press of the touchscreen, as well as a press of a button on a headband, you can turn on the unit, and it will start doing its job. This product uses binaural beats, which will affect your brain waves and offer that sensation of sleepiness. Some people claim that these binaural beats are not very effective, as they keep the light sleepers from falling asleep. However, in this case, the volume setting is easy to access. Aside from sleeping, you may also use this unit when you are meditating. By only using it for a few minutes a day, you should be able to relax your brain through the binaural beats delta waves. Many of those who left a review claimed that you only need around 10 minutes of meditation per day with this unit. The data will be stored automatically within the app, and you should be able to get a summary of your sleep cycle. This way, you will know precisely how your sleep is going – and whether it actually needs improvement at points or not. Most wearable sleep trackers are worn around the wrist to increase the comfort of the wearer – but wearing it in such a manner may lead to inaccuracies of the data. However, since this unit wraps around the head, it will collect the data “straight from the source.” You should be able to fine-tune it more efficiently since it will read much closer to your brain waves. The Sleep Shepherd Blue features active biofeedback functions that offer you readings in real time. This way, when you read the data in the morning, you will know precisely where your sleep needs improvement. Using state-of-art electroencephalographs (EEG), you will be able to monitor your sleeping patterns – and adjust the binaural beats to act accordingly. The sleep tracker will release binaural beats depending on the status of your brain. Not only will you be able to connect this to your Android smartphone, but you can also add it to your iPhone as well. You can download the app on both operating systems, and you will receive detailed readouts of your sleeping cycle. This sleep tracker will remember the settings of every sleeping session. Once you wake up, all you will have to do is hit the “End Sleep” setting, and the headband will stop recording. Not only will this help you save on battery, but it will ensure that it does not record data needlessly. The unit will update automatically with every nightly cycle. At the end of the week or month, you will be able to see whether your sleeping pattern has changed or if your REM sleep has actually improved. When you are trying to get a good night's sleep, you might have it disrupted if your head feels too warm and sweaty. This is why the breathable material of this unit is considered an essential feature – since it allows your skin to breathe even as you are wearing it. However, some customers have complained that it is still warm during the night – even with its moisture wicking properties. Another advantage is that the material is fairly easy to maintain. It may not be machine washable, but you can wipe it clean on the surface. However, you may want to use a damp cloth – or at most, a mildly damp cloth. For those who have issues with getting out of bed in the morning, this unit also features a smart alarm system. Instead of using a standard song that rudely wakes you up in the morning, this one turns it into a gradual process. The Sleep Shepherd Blue will use binaural beats to lift you out of your sleeping state gradually. It will slowly introduce alarm tones and a sensation of wakefulness so that you may get up without feeling startled. 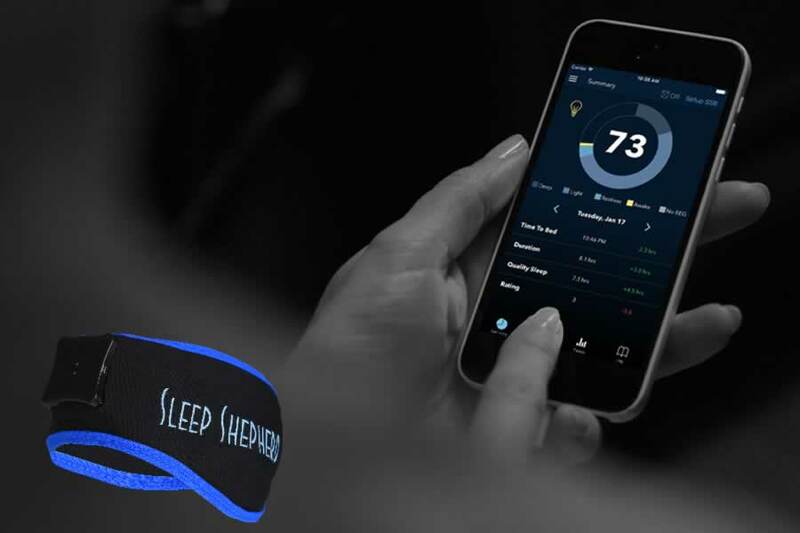 The Sleep Shepherd can measure brainwaves by using EEG sensors and technology developed by NeuroSky, Inc. Most wearable units are worn around the wrist, which may cause the monitor to offer inaccurate results if not used properly. However, considering that this unit wraps directly around your head, it will be much easier for the unit to read the data. Still, some customers have complained that for this product to provide accurate data, it needs to be positioned correctly around your head. If the EEG sensors are moved out of place, the readings will obviously no longer be as accurate. This has been an issue for some people, who complained that the product sometimes shifts around. However, if you do not tend to shift too much during your sleep, there should not be any issues. Sleep Shepherd Blue has been manufactured by Sleep Shepherd LLC – a company in Colorado that sells all types of natural sleeping aids. The company has only been founded in 2014, meaning that it does not have the experience of other similar brands; however, it has a fresh outlook, and a wish to bring innovation to the table. In the past, you could find this product on sale for around $200 – but the official store is currently closed, so the Sleep Shepherd Blue is no longer available. There are no alternative sellers to provide this product either – and considering that there have not been any updates on Kickstarter for more than a year, the chances are very low for you to find a new and improved product. You can find alternatives in brands such as Dreem at almost double the price – but with more sensors and fewer complaints. The Sleep Shepherd Blue has received a fair amount of complaints – and it is difficult to find a customer who actually recommends it. The rating is decent for the features that it offers – but there are certainly far better products out there that offer greater results. A good alternative for the Sleep Shepherd Blue is Dreem, which provides live EEG, as well as live heart monitoring. Granted, at $499 – more than double the price of the Sleep Shepherd Blue – one may find it quite expensive. However, considering that it has six sensors and more stability, it is a more valuable purchase. The Sleep Shepherd Blue's primary purpose is to monitor your brain and sleep – whereas Dreem can also improve the quality of your sleep. According to previous users, the Dreem customer service is also more responsive – which stands in opposition of Sleep Shepherd, which has no current activity. At the moment, it is quite hard to recommend the Sleep Shepherd Blue – for more than one reason. There have been no improvements to the model – and even if you could find a previous customer to sell his/her item, there are far too many complaints advising against the purchase of this product.